Nineteen weeks to the day. That is how long I have had one kind of splint or another (or cast) on my hand. Nineteen months and one day since the fall. 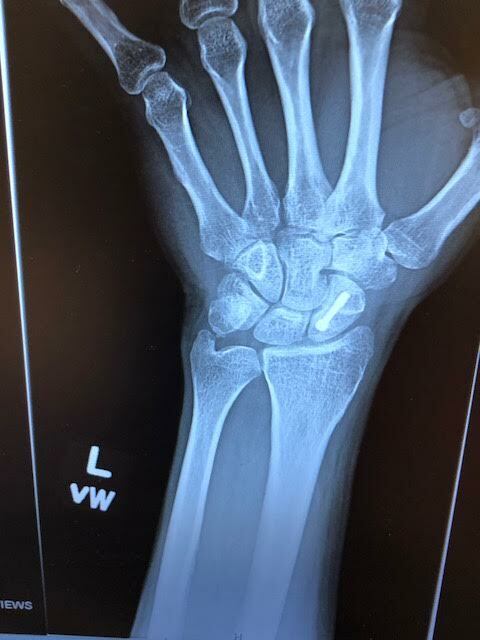 But at the 19 mark, the last splint came off. All told, I had the cast (obvi), but over the course of those years month weeks, I had five different splints. One of those - the second to last one - I'm still getting billed for. I keep sending it to Disability Management to fix it, as I owe, and will owe, nothing. I had to tell them it was about to start hurting my credit. Anyhoo.....Tuesday, the doctor saw fit to have me remove the splint. He had two med students with him. 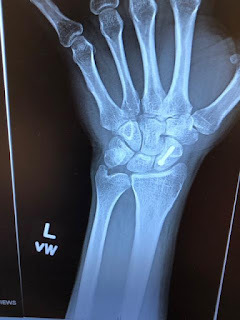 He showed the the incision point, but more importantly the two puncture wounds in my palm where he planed a potential exit point should the screw break off while inserting it. We are holding off on any OT / PT for a few weeks. He wants to see how things go with my normal use - though I have limitations. Nothing more than 5lbs in my left hand, so masturbation is still out, I suppose. What is odd - or possibly not - is how I have to re-re-learn everything. I adapted so much on how to dress, eat and work that taking the splint off almost as bad as having it on at first. I think I'm finally getting the hang of my keyboard. Dressing is a LOT quicker. Eating is still weird. I'm sure I'll get the hang of a fork and spoon again shortly. The best things though: well the padding on the edge was starting to fray, so that was starting to chafe my hand. And the splint would make me sweat......a lot! And that sweat would start to smell. So it's nice having my arm free, if just for that. The redness of my scar has already decreased a little since the splint came off. 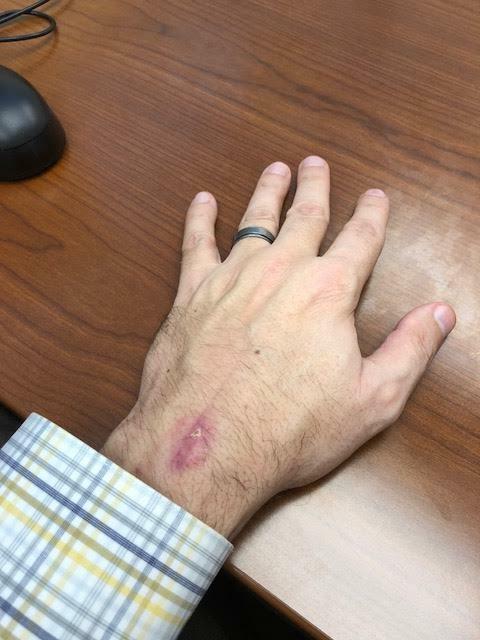 The scar might not come off so man-ish after it settles down. That's a little disappointing. But onward and upward. It's still sore, but I'm hoping that all changes as I continue healing. YAYZ! doesn't look too bad. self-love with the right hand, dear. or have 710 help you! What Anne Marie said, and, thumbs up.